Ancient rock samples are limited, hindering the investigation of the processes operative on the Earth early in its history. Here we present a detailed study of well-exposed crustal remnants in the central Slave craton that formed over a 1 billion year magmatic history. The tonalitic-granodioritic gneisses analysed here are broadly comparable to common suites of rocks found in Archean cratons globally. Zircon Hf isotope data allow us to identify a major change in the way continental crust was formed in this area, with a shift to distinctly positive εHf starting at ~3.55 Ga. The crust production processes and spatial distribution of isotopic compositions imply variable interaction with older crust, similar to the relationships seen in modern tectonic settings; specifically, long-lived plate margins. A majority of the Slave craton might have been formed by a similar mechanism. Figure 1 Geologic map of the Slave craton highlighting the major domains that contain basement gneisses. Map modified from St. Onge et al. (1988); Bleeker et al. (1999a,b). Major basement complexes are shown along with crustal province boundaries inferred from Nd and Pb isotope data (Davis and Hegner, 1992; Thorpe et al., 1992). Red stars indicate key locations sampled in this study and coloured circles are locations where detrital zircons have been analysed for their U-Pb-Hf systematics as described in Figure 3 and the Supplementary Information. Figure 2 (a) Molar K-Na-Ca diagram. Orange squares are CSBC samples from this study. Green symbols are <3.6 Ga samples from the Acasta Gneiss Complex, small squares are samples measured by Reimink et al. (2016b) and dark green circles are samples added in this study. Contour density fields are high pressure TTGs (black), medium pressure TTGs (medium grey), low pressure TTGs (light grey), and potassic Archean grey gneisses (pink). Data used to construct these fields are taken from Moyen (2011). The blue field outlines sodic trondhjemites. (b) La/Yb versus Sr/Y for rocks from the Slave basement gneisses. Symbols as in (a). Figure 3 Zircon Hf isotope data from Slave basement gneisses. Orange symbols are analyses from the CSBC, blue are new analyses from the AGC, grey diamonds are a compilation of Acasta Hf isotope data (sources in the text), and small circles are single detrital zircon analyses from sediments of the Slave Craton Cover Group sequence (Pietranik et al., 2008). Note that detrital zircon analyses are grouped by sediment location (see Supplementary Information). 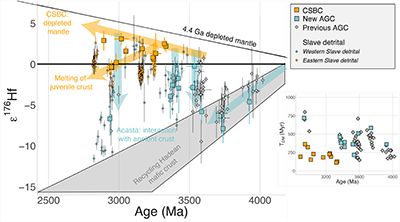 Grey field is the evolution of Hadean mafic protocrust, while orange and blue lines show our interpretations (sloped lines for time-integrated isotope evolution, vertical lines for mixing) for systematic petrogenetic differences between the two portions of the Slave basement gneisses. The Archean depleted mantle evolution line shown here is the connector line between a chondritic source at 4.4 Ga and modern MORB εHf values of +17. Calculated with respect to this model evolution for the depleted mantle, the inset shows the maximum crustal residence times (depleted mantle model ages calculated using a source 176Lu/177Hf of 0.015, and then subtracting the U-Pb crystallisation age from this model age) for all Slave craton Hf isotope data. The transition from long to short crustal residence times occurs at 3.6 Ga.
Dhuime, B., Wuestefeld, A., Hawkesworth, C.J. (2015) Emergence of modern continental crust about 3 billion years ago. Nature Geoscience 8, 552–555. ), details of the timing of its extraction from the mantle and the mechanism of continental growth remain unclear, in part because of an incomplete rock record in many areas. Here we study an ancient crustal terrane that preserves an exceptionally long record of crustal production, allowing us to track the geodynamic processes of crust formation for over 1.5 Gyr. Archean cratons are blocks of stable continental crust >2.5 billion years old, forming the cores of Earth’s most ancient continents. The Slave craton of the Northwest Territories, Canada is an archetypal example, with extensive exposures of Meso- to Palaeoarchean rocks, making it ideally suited for tracing crust formation and reworking in the Archean. Moyen, J.-F., Martin, H. (2012) Forty years of TTG research. Lithos 148, 312–336. Reimink, J.R., Chacko, T., Carlson, R.W., Shirey, S.B., Liu, J., Stern, R.A., Bauer, A.M., Pearson, D.G., Heaman, L.M. (2018) Petrogenesis and tectonics of the Acasta Gneiss Complex derived from integrated petrology and 142Nd and 182W extinct nuclide-geochemistry. Earth and Planetary Science Letters 494, 12–22. and references therein) can be used to explore how the younger, more geographically expansive, CSBC is related to the AGC in the subsequent billion years of crustal evolution. The new data presented here from both younger AGC samples (3.4-2.94 Ga) as well as a suite of 3.4–2.9 Ga CSBC samples, allow direct examination of the evolution of the broader Slave craton. Bowring, S.A., Williams, I.S. (1999) Priscoan (4.00–4.03 Ga) orthogneisses from northwestern Canada. Contributions to Mineralogy and Petrology 134, 3–16. Reimink, J.R., Chacko, T., Stern, R.A., Heaman, L.M. (2016a) The birth of a cratonic nucleus: lithogeochemical evolution of the 4.02–2.94 Ga Acasta Gneiss Complex. Precambrian Research 281, 453–472. ), which are used here to evaluate continued crustal growth in the broader Slave craton. 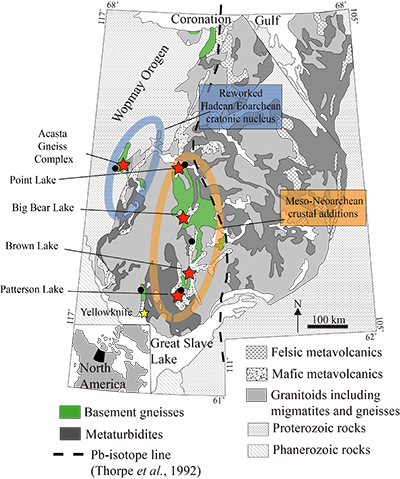 Isachsen, C.E., Bowring, S.A. (1997) The Bell Lake group and Anton Complex: a basement – cover sequence beneath the Archean Yellowknife greenstone belt revealed and implicated in greenstone belt formation. Canadian Journal of Earth Sciences 34, 169–189. Ketchum, J., Bleeker, W., Stern, R.A. (2004) Evolution of an Archean basement complex and its autochthonous cover, southern Slave Province, Canada. Precambrian Research 135, 149–176. van Breemen, O., Davis, W.J., King, J.E. (1992) Temporal distribution of granitoid plutonic rocks in the Archean Slave Province, northwest Canadian Shield. Canadian Journal of Earth Sciences 29, 2186–2199. Sircombe, K.N., Bleeker, W., Stern, R.A. (2001) Detrital zircon geochronology and grain-size analysis of a ∼2800 Ma Mesoarchean proto-cratonic cover succession, Slave Province, Canada. Earth and Planetary Science Letters 189, 207–220. Bleeker, W., Davis, W.J. (1999) The 1991-1996 NATMAP Slave Province Project: Introduction. 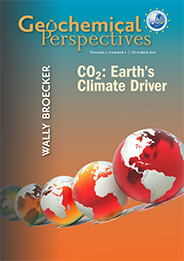 Canadian Journal of Earth Sciences 36, 1033–1042.
. Distinct magmatic pulses are evident at ~3.4–3.3 Ga, 3.26–3.2 Ga, 3.16–3.1 Ga, 3.06–3.01 Ga, 2.99–2.93 Ga, and 2.9–2.85 Ga. This nearly continuous record of magmatism makes the CSBC an excellent natural laboratory to study crust formation mechanisms over an important period of continent formation on Earth. Sample descriptions, whole rock compositions, and U-Pb-Hf data from individual analyses can be found in the Supplementary Information, along with intra-rock sample averages (i.e. averages from all magmatic zircons within a given sample) plotted in Figure 3. ). The La/Yb and Sr/Y of sodic melts typically increase with more residual garnet and a greater depth of melting. 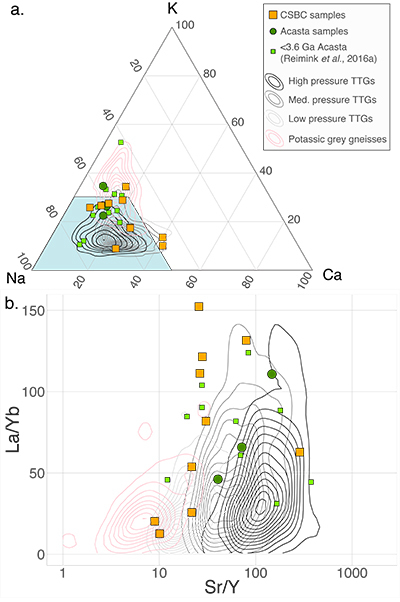 CSBC rocks have a range in La/Yb and Sr/Y, but they fall within the range of Archean TTGs, typically comparable to the medium and high pressure TTGs (Fig. 2). Iizuka, T., Komiya, T., Johnson, S.P., Kon, Y., Maruyama, S., Hirata, T. (2009) Reworking of Hadean crust in the Acasta gneisses, northwestern Canada: Evidence from in-situ Lu–Hf isotope analysis of zircon. Chemical Geology 259, 230–239. Bauer, A.M., Fisher, C.M., Vervoort, J.D., Bowring, S.A. (2017) Coupled zircon Lu–Hf and U–Pb isotopic analyses of the oldest terrestrial crust, the >4.03 Ga Acasta Gneiss Complex. Earth and Planetary Science Letters 458, 37–48. Iizuka, T., Komiya, T., Ueno, Y., Katayama, I., Uehara, Y., Maruyama, S., Hirata, T., Johnson, S.P., Dunkley, D.J. (2007) Geology and zircon geochronology of the Acasta Gneiss Complex, northwestern Canada: New constraints on its tectonothermal history. Precambrian Research 153, 179–208, doi: 10.1016/j.precamres.2006.11.017. Guitreau, M., Blichert-Toft, J., Mojzsis, S.J., Roth, A.S.G., Bourdon, B., Cates, N.L., Bleeker, W. (2014) Lu–Hf isotope systematics of the Hadean–Eoarchean Acasta Gneiss Complex (Northwest Territories, Canada). Geochimica et Cosmochimica Acta 135, 251–269. Kemp, A.I.S., Wilde, S.A., Hawkesworth, C.J., Coath, C.D., Nemchin, A., Pidgeon, R.T., Vervoort, J.D., DuFrane, S.A. (2010) Hadean crustal evolution revisited: New constraints from Pb–Hf isotope systematics of the Jack Hills zircons. Earth and Planetary Science Letters 296, 45–56. O’Neil, J., Boyet, M., Carlson, R.W., Paquette, J.-L. (2013) Half a billion years of reworking of Hadean mafic crust to produce the Nuvvuagittuq Eoarchean felsic crust. Earth and Planetary Science Letters 379, 13–25. Reimink, J.R., Chacko, T., Stern, R.A., Heaman, L.M. (2014) Earth's earliest evolved crust generated in an Iceland-like setting. Nature Geoscience 7, 529–533. ). In contrast, the positive initial εHf values in the CSBC show that this geographically dominant swath of evolved crust was not derived by the remelting of long-lived Hadean mafic crust. Instead, the vast majority of the pre-2.9 Ga Slave craton was progressively, and rapidly, derived from mantle sources throughout the Mesoarchean without significant interaction with older crust. What isotopic variation is present can be easily explained by a small amount of assimilation of the older generation of CSBC crust (ca. 3.3–3.4 Ga).
) dictate that rocks of these compositions were not direct mantle melts but instead formed by partial melting of mantle-derived basalts, thus requiring some, albeit short, intervening crustal residence history in the isotopic evolution from their mantle source. Maximum crustal residence times can be estimated by calculating the difference between the age of the rock and the depleted mantle model ages for the Hf isotope data (using an average Lu/Hf ratio for mafic crust and a model depleted reservoir). These residence times depend on the assumed Hf isotope evolution of both the crustal precursor and the depleted mantle, so they should be considered relative values rather than absolute time intervals. Nevertheless, the relatively brief protocrustal residence prior to melting to produce the CSBC TTGs is distinctly different from the >400 Myr protocrustal residence times documented in several Hadean-Eoarchean crustal blocks described above, including the AGC (Fig. 3, inset). The relatively rapid reworking of mafic protocrust in the CSBC is similar to that seen in parts of many Neoarchean terranes and the modern plate tectonics dominated Earth. Magmatic events occurred in both the CSBC and the AGC during similar times (3.4–3.3 Ga and 2.95 Ga), and produced rocks with similar elemental compositions (Fig. 2). The Hf isotope distinction between these two crustal blocks, where rocks from the CSBC have higher initial εHf values than their AGC counterparts (Fig. 3), is important for evaluating crustal production mechanisms. In the AGC area, Hadean-Eoarchean crust was involved in the formation of Mesoarchean granitoids whereas CSBC rocks were mostly derived from newly formed sources whose isotopic compositions were similar to some models for Archean depleted mantle compositions (i.e. positive εHf values). Collins, W.J., Van Kranendonk, M.J., Teyssier, C. (1998) Partial convective overturn of Archaean crust in the east Pilbara Craton, Western Australia: driving mechanisms and tectonic implications. Journal of Structural Geology 20, 1405–1424. Smithies, R.H., Champion, D.C., Cassidy, K.F. (2003) Formation of Earth’s early Archaean continental crust. Precambrian Research 127, 89–101. ). This feature is notably absent in all of the CSBC Hf isotope dataset. Kistler, R.W., Peterman, Z.E. (1973) Variations in Sr, Rb, K, Na, and Initial Sr87/Sr86 in Mesozoic Granitic Rocks and Intruded Wall Rocks in Central California. Geological Society of America Bulletin 84, 3489–3512.
) that mimic the trends of the 3.4–2.9 Ga Slave craton gneisses. Næraa, T., Scherstén, A., Rosing, M.T., Kemp, A.I.S., Hoffmann, J.E., Kokfelt, T.F., Whitehouse, M.J. (2012) Hafnium isotope evidence for a transition in the dynamics of continental growth 3.2 Gyr ago. Nature 485, 627–630. ), suggesting that such transitions were not contemporaneous global changes, but occurred in different places at different times. Nevertheless, the CSBC represents a clear example of Mesoarchean crust that was formed by addition of new, juvenile, mass to the continent. We thank Chiranjeeb Sarkar for assistance with the U-Pb-Hf analyses, Scott Cairns and the Northwest Territories Geological Survey office for field support, and Tom Chacko, Ann Bauer, and Josh Davies, for valuable discussions. We also thank Matt Scott and Michael Long for assistance in the field. Thoughtful reviews by Tony Kemp and one anonymous reviewer substantially improved this manuscript. We thank Helen Williams for editorial handling. The Hf isotope data from AGC granitoid rocks are broadly similar to trends seen in previous Hf isotope studies of AGC zircons (e.g., Iizuka et al., 2009; Bauer et al., 2017; Fig. 3). Notably, >3.6 Ga zircons from the AGC have significantly negative initial εHf values that fall along an evolution line suggestive of reworking of Hadean protocrust (e.g., Bauer et al., 2017). The new AGC data are consistent with a previous model suggesting that >3.7 Ga rocks in the AGC were derived by melting of long-lived Hadean protocrust (e.g., Iizuka et al., 2009; Guitreau et al., 2014; Bauer et al., 2017; Reimink et al., 2018), which has been documented in several other ancient gneiss localities (e.g., Kemp et al., 2010; O’Neil et al., 2013). Multiple magmatic pulses have been clearly defined within the Slave basement gneisses (van Breemen et al., 1992; Bleeker et al., 1999a; Sircombe et al., 2001; Ketchum et al., 2004), with major events from 4.02–2.8 Ga defined by Bleeker and Davis (1999) and summarised by Sircombe et al. (2001). The core of the Slave craton­—the Central Slave Basement Complex (CSBC; Bleeker et al., 1999a,b)—consists of extensive exposures of basement gneiss thought to extend even farther beneath younger granitoids (Davis and Hegner, 1992; Thorpe et al., 1992; Fig. 1). Figure 1 [...] Map modified from St. Onge et al. (1988); Bleeker et al. (1999a,b). The definition of the CSBC (Bleeker et al., 1999a) encompasses the zone of exposed basement gneisses in the central to south-central portion of the craton, including the Acasta Gneiss Complex. 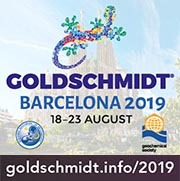 Previous work on the CSBC focused on preliminary field characterisation, geochronology, and its structural evolution (e.g., Isachsen and Bowring, 1997; Bleeker et al., 1999a,b; Ketchum et al., 2004). The Acasta Gneiss Complex, on the westernmost margin of the Slave craton (Fig. 1), has received by far the most scientific interest due to the presence of the oldest known zircon-bearing rocks on Earth (e.g., Bowring and Williams, 1999; Reimink et al., 2016a). Several Archean granite-greenstone terranes appear to have been generated by some form of so-called ‘vertical tectonics’ either by a density inversion formed by erupted mafic rocks lying on top of partially molten, granitic, mid-crust (e.g., Collins et al., 1998), or by melting at the base of a thickened oceanic plateau (e.g., Smithies et al., 2003). Figure 1 [...] Major basement complexes are shown along with crustal province boundaries inferred from Nd and Pb isotope data (Davis and Hegner, 1992; Thorpe et al., 1992). In fact, this subduction-accretion process was invoked to explain isotopic trends in ~2.6 Ga granites in the Slave craton (Davis and Hegner, 1992) that mimic the trends of the 3.4–2.9 Ga Slave craton gneisses. Though many recent models suggest that a large fraction of the present crust formed in the Archean (e.g., Dhuime et al., 2015), details of the timing of its extraction from the mantle and the mechanism of continental growth remain unclear, in part because of an incomplete rock record in many areas. Magmatic assimilation of ancient crust is the preferred mechanism for isotopic mixing in this case, supported by the presence of >3.6 Ga xenocrystic zircons found in 3.6 Ga magmatic rocks (e.g., Iizuka et al., 2007; Reimink et al., 2016a). When subduction zones are developed along continental margins, the new magmas produced in these settings often show isotopic signatures that systematically vary from primitive mantle-like near the subduction zone to more isotopically evolved compositions toward the continental mass (e.g., the 87Sr/86Sr = 0.706 line in the Western US; Kistler and Peterman, 1973). The sodic nature of these CSBC granitoids (Na2O/K2O generally >1.3) and relative enrichments in the incompatible trace elements suggests a derivation by partial melting of hydrated basalt (as summarised in Moyen, 2011; Moyen and Martin, 2012). Figure 2 [...] Data used to construct these fields are taken from Moyen (2011). Although other cratons are also endowed with basement gneiss complexes (e.g., Moyen and Martin, 2012), the Slave craton is exceptional for the age range of exposed crust within a coherent geographic area. Most of the rocks analysed here from the CSBC have elemental compositions similar to typical Archean grey gneiss suites (Moyen and Martin, 2012) and can be classified as TTGs (tonalite-trondhjemite-granodiorites). Prevailing models for Archean TTG petrogenesis (e.g., Moyen and Martin, 2012) dictate that rocks of these compositions were not direct mantle melts but instead formed by partial melting of mantle-derived basalts, thus requiring some, albeit short, intervening crustal residence history in the isotopic evolution from their mantle source. Indeed, the CSBC rocks have trace element compositions compatible with a subduction zone (e.g., enrichment in large-ion lithophile elements and depletion in high field strength elements; Fig. S-2), and such signatures have been used to argue for evidence of plate margin settings in the Archean, though this is far from resolved (e.g., Moyen et al., 2012). Similar geodynamic changes have been invoked for other locations on Earth at different times (e.g., Næraa et al., 2012), suggesting that such transitions were not contemporaneous global changes, but occurred in different places at different times. This differs significantly from the original interpretation of a previous study (Pietranik et al., 2008) that used detrital zircons from the sedimentary sequence deposited directly on the CSBC rocks. These detrital zircon grain U-Pb-Hf data were grouped from across the entire craton, lumping terranes together to infer episodic mafic crust extraction and protracted reworking (Pietranik et al., 2008). Figure 3 [...] Orange symbols are analyses from the CSBC, blue are new analyses from the AGC, grey diamonds are a compilation of Acasta Hf isotope data (sources in the text), and small circles are single detrital zircon analyses from sediments of the Slave Craton Cover Group sequence (Pietranik et al., 2008). Rocks of the AGC that were produced from melts of this protocrust have major element compositions representative of shallow-level differentiation, both by fractional crystallisation and shallow-level melting (e.g., Reimink et al., 2014, 2016a,b, 2018). Recent petrologic and geochemical studies have documented systematic trends in the geochemical character of AGC rocks through time (e.g., Reimink et al., 2016b; 2018), which are used here to evaluate continued crustal growth in the broader Slave craton. Figure 2 [...] Green symbols are <3.6 Ga samples from the Acasta Gneiss Complex, small squares are samples measured by Reimink et al. (2016b) and dark green circles are samples added in this study. By 3.7 Ga, the Acasta area had stabilised as an evolved continental nucleus produced by reprocessing of Hadean-aged protocrust (e.g., Reimink et al., 2016b; 2018). The detailed petrologic and tectonic framework for the formation of the Acasta Gneiss Complex (AGC) from 4.02 to 3.4 Ga (e.g., Reimink et al., 2018 and references therein) can be used to explore how the younger, more geographically expansive, CSBC is related to the AGC in the subsequent billion years of crustal evolution. In contrast, crustal residence times recorded in areas where melting at the base of an oceanic plateau is invoked, such as the Pilbara craton, extend up to a billion years, and crust formed in this manner has depleted mantle model ages reflecting this ancient parentage (e.g., Smithies et al., 2003). Download Tables S-1 and S-2 (Excel).